As this Sunday is a Regional training day and a number of our non-regional players will be playing for Ampthill in the afternoon, there will be no girls' training at Letchworth on Sunday 3rd February. The U15 and U18 Ampthill v. Aylesbury matches on Sunday are due to kick off at 2pm. Will all Letchworth players who are taking part in these games please meet at the Letchworth clubhouse by 12.30pm to travel to Ampthill. On the odd previous occasion when comments on alleged National Cup activities have been mentioned here the administrative equivalent of the world has fallen on my head with demands for apologies, accusations of being a poor loser, of exaggeration, and such for even daring to suggest that something odd might be going on. Because it never happened (or at least no-one ever admitted to doing it). It is therefore interesting therefore that one club taking part in this year's competition have passed the an official email from RFUW onto me, because they are concerned that whatever never happened before might still be whatever the antithesis of "rife" might be (if you see what I mean). The rules were significantly tightened up for this season, but apparently RFUW have heard that "a number of teams are trying to borrow better/regional players from other clubs to play for them in the National Cup Competition. This is not allowed and any team found trying to enhance there playing position by doing this will be removed from the Competition. " The email does go on to mention that "teams that have official clusters and have registered these with the RFUW" can still enter, and concludes that the competition "is not about getting the best 13 or 15 players on the pitch." Draw what conclusions you wish but it is a pity that the the only major 15-a-side club tournament for girls clubs should continue to be shrouded by such rumours and unpleasantness. Okay, one comment then. If clubs are doing this then... why? What is the point? Is a bit of silverware really that important? What effect must it have on players sidelined by "borrowed" stars? How do such actions develop clubs, or players, or the game in general (especially those clubs from whom players are "borrowed")? Are there not more than enough opportunities for elite players to play together at county and region as it is? Why must "ordinary" club rugby players always be sidelined and excluded? 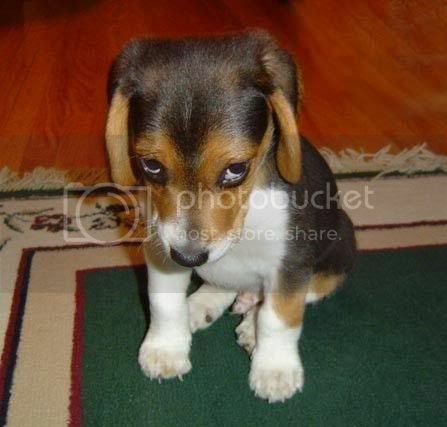 ["Oy - didn't Letchworth borrow players last year then", I hear some readers cry? Well actually we openly played as a combined team with Sudbury - and I think that pretty much every girl available on the day of each round from both clubs took part, all getting - so far as was possible - equal game time]. Contrary to what was said on Sunday, Simon has asked if training on Thursday could start at 5.30pm (until 7.00) due to 1st XV training being brought forward. If you cannot make this earlier start, then still come along as soon as you can make it afterwards (don't think you will be unwelcome if you cannot make it until 5.45 or 6.00!) but obviously it will help if as many of you as possible are there at 5.30. As noted by Vincent on the Eastern Counties blog, Carol Isherwood has announced that she is standing down as the RFUW's director of rugby. 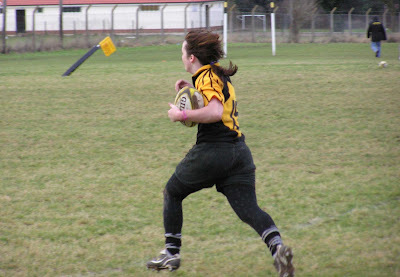 Carol has been involved in women's rugby, as player or administrator, since the very beginning. To be pedantic and correct Vincent ever so slightly she was a founder member - the first Secretary no less - of the WRFU (not RFUW) from its formation in 1983. This was a unique UK-wide rugby union, but eventually broke up as first Ireland, then Scotland, and finally Wales left to form their own unions leaving England to establish its own union - the RFUW - in 1994. A minor quibble, but one which goes some way to explain the current union's slightly odd name. 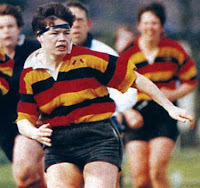 As a player she was the first captain of the short-lived Great Britain international team (playing in all seven of their games between 1986 and 1989), and was also the first captain of England in 1987, gaining eight international caps with the red rose. She also gained an OBE for services to women's rugby in 2003. So, how does this affect us, I hear you cry (even assuming you have read this far)? Well, in the short term not much - certainly not until Carol's post is filled. But in a small, tightly run game where the activities of the central governing body can have a significant effect on the grass roots any change will filter down pretty quickly. The RFUW is a still a very young organisation, and up until now has been inevitably run by the same people since its formation. Now the ball could be being passed to the next generation. New faces invariably bring in new viewpoints, and new ideas (it is rare that someone joins an organisation with the aim of keeping things as they are!). These ideas will affect the game, and the competitions, that you play. How? Who knows - but watch this space (or maybe this one!). Mike will no doubt be adding the photographic evidence from today's games in Westcliff. Suffice to say the only real downside today - other than Ruby's injury (and news on that?) - was the actual results because we didn't play that bad. Slightly blown away by Worcester in the first few minutes, but heads stayed up (showing that we've moved on a bit from earlier in the season) and eventually the value of the basic training regime of HM Armed Forces was demonstrated. And later Randy was to do it again at the other end with one of the best last ditch tackles at the end of a scoreless second half against Westcliff. Admittedly there had been the odd other score by both Worcester and Westcliff/Sudbury in the interim. Well, half a dozen odd scores or more in fact. And half the team turning their backs and strolling into line after giving away a penalty to Worcester only about 7m out (and then seeming mildly surprised to see a flash of blue and gold shoot by) was perhaps not the best example of what we are capable of. And we could maybe look to move the ball wider and more quickly (there is still a tendency for centres to take the ball into contact too early too often) - but on the plus side it was good to see our forwards more than match their prestigious West Midlands opponents in the set pieces. Other things to look at? A few that no doubt Simon will be working on. Perhaps one question might be why we are still giving away so many points in the first few minutes of our games (if memory serves 17-0 down to Worcester and 10-0 down to Westcliff in the first five minutes or less of each game). And we really do need to find someone who can hold up the club's honour at post-match eating and drinking games. Hayley spectacularly failing last year, Jess this, not to mention the entire team being whitewashed by the Canadians last Easter... its not good. Definately an area of the game that we need to work on! U15s - due to the away fixture for the U18 team, there will not be U15 training on Sunday. The next training session will be at the club at 5.30pm on Thursday 31st January. U18s - have a three way tournament at Westcliff RFC between Westcliff/Sudbury, Worcester and ourselves. Please meet at the club by 11am on Sunday to travel to Westcliff by 12.30pm for a first match kick-off at around 1pm. If at all possible, please arrive at Westcliff in your playing kit, as they have a lot of boys fixtures in the morning and the changing rooms may not be cleared for when we arrive. The club is located at The Gables, Aviation Way, Southend-on-sea, Essex SS2 6UN. I will bring copies of a map of the area and the route to the club on Sunday morning, if you need them. Saracens Girls are the latest team to launch a club blog to go alongside their "official" club website. 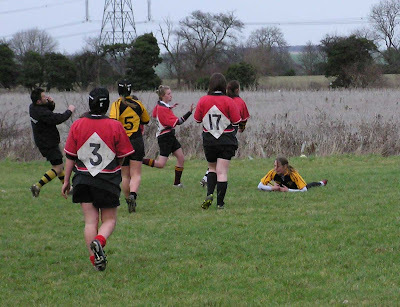 Saracens Girls Rugby covers the now familiar territory of clubs news, though majoring in this case on their U15 team as well as the performance of their girls in county tournaments - the first few reports includes a brief summary of the U15 game at Letchworth two weeks ago. Please note that, due to the high recent rainfall, the training pitch will be rested this week and training will be from 6.00 - 7.30 pm at the Baldock Cricket Club, Avenue Park, West Avenue, Baldock. Please note that boots are not allowed and trainers should be worn instead. Worcester have published a match report on their last game on their blog - 0-0 draw against a team packed with TDGs and England U20 squad girls! Sunday promises to be quite a day - though at the minute the main fear must be that, unless it stops raining, our second game against the biggest name in girls rugby could be ruined just as the first was at the National 10s. Anyway, on the assumption that water wings will not be needed this time, we clearly need to work hard in advance of the weekend - so lets have a good turnout this Thursday! West Hill Secondary School, from Owen Sound in Ontario, have contacted us about a possible fixture during their tour of England in March. West Hill would appear to be a "near neighbour" (in Canadian terms!) of IE Weldon, being only 150 miles or so away, so perhaps they have been talking. The school would appear to be not quite as strong as Weldon - but any Canadian opposition has to be taken seriously. The proposed date - 8th or 9th March - is a regional training weekend so we do not currently have a fixture, and there will also be a fair few girls from other clubs looking for a game so a "mini-tournament" like last year's Canada Day would seem to be possible. Mixed news (so far) from the trials. Hayley had a far better day this year than last and is in the East squad. No confirmation on any other names yet, but it would be surprising if Sasha was not through as well. Of our other trialists Jess was not to confident about her chances after the trials, saying that it had not gone well (actually those were not her precise words...) while Fern had decided to withdraw from East Midlands regional trials before Sunday due to pressure of school work. Still, Laura will have another chance in a couple of weeks. I am looking through the window desparately trying to find this blue moon, but fear that the herd of flying pigs might well obscure it. Why so? Because the RFUW have done something that some of us would never have thought possible even four or five years ago. Its incredible, but true - the calendar for next season has been published - in January!!!!!!!! But that was then and this is now. The world has moved on and now fixture secs across the country can begin plan ahead for 2008-9 with confidence. County dates: 28/9, 19/10, 9/11, 30/11, 14/12. Regional dates: 11/1, 25/1, 1/2, 8/2, 21/2, 22/2, 8/3, 15/3. Right. Now, if you are an RFUW official and easily offended then stop reading here. What follows is a personal view of matters related to the above. So no threats of excommunication, please. However, it would be nice if you could maybe read on and take it as it is meant - ie. positive criticism, the start of a debate maybe, a view from the grassroots perhaps. Because here also endeth the good news as when we examine this - unless I am mistaken - you will notice that regional rugby will take place over eight of the weekends between 11th January and 15th March 2009 . Or to put it another way... that's eight weekends out of eleven! Yes, folks, ordinary club players - like, well, most of you - have been generously given a generous three weekends to play in a period of effectively three months at the start of 2009. And one of them is half term! Come on here - do Twickenham want a wide club network for girls of all ages and abilities, or a narrow sport played by only a tiny elite? Because if this is anything to go by then I think the answer is pretty obvious! How long can a club game keep going with a three month hole in the middle of the season? Chuck in the problem of the U18 band having exams for everyone in the spring and - for mere mortals - rugby is now just game played for eight or nine weekends every autumn. After that, well, the game seems to lose interest in most of you, let us say. Then, to compound this, having come out of hibernation clubs are dropped straight into the National Cup. So that means ordinary club players who probably not have had any serious games for three months will be pitted alongside regional players fresh from their championship. But there is so much to pack in, some may say, regional coaches need access to players to create teams, grants are based on the performance of national teams. Not all clubs can field full teams on their own, have to combine, regional only opening for high quality rugby. And so on. Well, I've said it before and I'll say it again - IMHO a game is only as strong as its roots. If the roots are given no room to grow, develop and deepen then the flower will eventually wither. And die. The Ampthill U15 game at Welwyn is now postponed, apparently. Sorry guys - but the following weekend is still on! Following our combining with Ampthill last Sunday, we can - after a year of a less than satisfactory situation - at last look forward to a positive future for our small but loyal band of U15s. Sunday week will see the U18s at Westcliff, but the U15s will now have a game as well as Ampthill have invited us to join then for a U15 game against Welwyn at Welwyn. The following weekend (3rd February) will also see them in action with Ampthill at Ampthill against Milton Keynes/Aylesbury. Meanwhile the fixture at Westcliff for the U18s sounds a tasty weekend now as it will also include games against Sudbury and Worcester - well worth the trip! Finally, some late news from the regional trials is that Charlie has also now been called up as a late addition following withdrawls amongst the forwards. First, a reminder that training this Thursday is at 5.30 as the Firsts are training from 7.00. If you cannot make 5.30 then... well, come along as soon as you can. On Sunday its training for non-regional trailists (ie. most people) at 10.00am. Now the blog - or at least the comment sections. We (well, I) have always fought hard to keep the blog open to all - to encourage debate and discussion by anyone because, lets face it, there are very few opportunities for that to happen. Anyone can leave messages. And for two or three years now, apart from a few cases were writers have used inappropriate languag, we have kept to this complete openness. It is but one feature which has kept the blog up there as one of (if not the) most popular UK websites on girls rugby. But of late one or two visitors from outside the club have really begun to take advantage of this - abusing the system and really not taking any sort of hint to stay within reasonable bounds. Much as we have nothing against criticism in principle, using the blog as a forum to to have a go at the club or its officials, safely hidden behind an alias is not on - especially when the attacks (there is no better word) invariably come from clubs who have not adopted such an policy of openness on their electrionic fora (even supposing they had them) - is getting a beyond reasonable bounds. For the time being therefore we will be introducing a layer of moderation into these discussion section of the blog. This means that discussions contributions will not appear immediately, but only after they have been approved for publication. Hopefully this will calm things down and encourage the more childish element amongst our wider readership to return to MSN. To the more grown up majority all I can do is apologise. I still hope that 99% of comments as usual will still appear, just after a short delay maybe. Sunday was a mild and dry day which was ideal for our matches against Saracens for which we were joined by Ampthill who combined with Saracens to play against Letchworth U18s and, with some help from Letchworth, provided the opposition for Saracens U15s. The matches, which were played in a good spirit, saw Saracens U15s beating Ampthill/Letchworth by 70 - 0 and Letchworth U18s beating Saracens/Ampthill by 29 - 0. This Sunday we are joined by Ampthill to host matches against Saracens for both U15 and U18 teams. The intention is to combine clubs with smaller squads to give one good game in each age band for all the players attending. Will all players please meet at the club at 1pm. Training mix-up - sorry everyone! A combination of Christmas holidays, club notices which allowed for different interpretations, attempts to change things by letter half-way through a season, and different people reading different things (or not) meant that while most of you turned up at 10.00 this morning (including Simon) some came at 11.30. My profuse apologies for those who came at the later time and therefore had wasted journeys. With several people now involved with running the section that does have an advantage of spreading the load, which makes for a stronger organisation. But it also means that we have to ensure (not just assume) that we all get the same information (and interpret it the same way! ), which I obviously failed to do. With different people in the management team spread all over the place over Christmas there was not opportunity to correct the misunderstandings... and so some of you turned up just in time to see everyone else retiring to the changing rooms. We'll get the times of any future Sunday training sessions absolutely confirmed one way or another nearer the time - but next weekend is a fixture, so we are at home for a 2pm kick-off so that should be a meet of 1pm... but we'll confirm this on Thursday! Training has now begun again, for those who were asking. Unfortunately I have been in remotest Devon with limited PC access but most of you should have worked out that the first session or the year was yesterday. This Sunday we have training at Letchworth - note new weekend training times above - and then one more session on Thursday before the first fixture of the new year, against Saracens. This will include both U18s and U15s - we can be confident about Saracens bringing a good party of the latter, and when I last heard discussions about our link-up with Ampthill were going well so that we can field a combined side. We should also be virtually injury free now - Laura, Jess and Sasha seemed to have survived their game with the Candians unscathed, and hopefully Megan, Mel, Emily and Carla are fully fit again, and everyone has avoided bizzare chocolate-related (or similar) accidents over Christmas this year - so we can put the first half of the season behind us and look forward to second half with some confidence, indeed excitement - the tour, tens competitions, then the sevens - there is plenty to come between now and May. Five of our girls are have been selected to go trial for regional fame and glory at the end of the month. Congratulations go to Hayley, Laura and Jess who have all been selected by Hertfordshire to go forward to the East Region trials on 20th January at The Coopers Company & Coborn School (St Mary's Lane, Upminster, Essex, RM14 3HS) where they will join Sasha there who has been selected by Eastern Counties. Fern will also be attempting to get back into the East Midlands squad in a separate trial at Melton Mowbray on the same day. Commiserations to Emily, Katie and Charley - but Emily and Charley will have another chance next year (and probably a very good chance with so many of this year's team in their final year of junior rugby - next season promises to be quite strange with so many familiar faces in opposition teams missing! 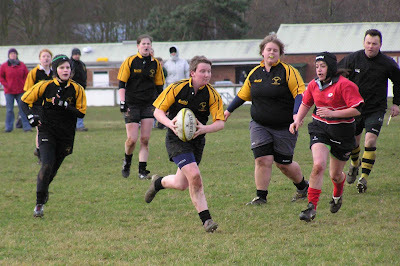 ), while we expect that Katie will be making a name for herself in student rugby. All five girls selected should know (but I'll take this opportunity to remind them) that they MUST still register online for the trials themselves. The fact that their counties have put them forward does not mean that they have been registered. Click here for details of what you need to take with you (etc.) and then click here for the actual form. You will need to pay £5 for the trials when you register (not on the day) so you will need a credit or debit card to do that, so you'll probably need a parent (or at least their plastic) to hand when you fill the forms in.